Team Jamieson (Alberta) in women’s curling and Team Chan (BC) in men’s curling qualified to represent Canada at the 2019 Winter Deaflympics. 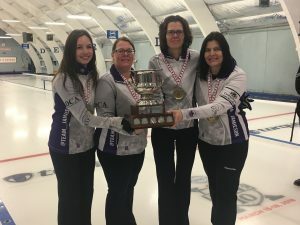 Both teams won their respective curling tournament on February 24th at the Canada Deaf Games that were held from February 21st to 24th in Winnipeg. Team Jamieson won its first two games in the round robin against Team Tung from BC (9-3) and Team Bériault from Manitoba (10-7), but lost its third game facing interprovincial Team Logan (7-9). With four victories and two losses in the round robin, Team Jamieson made it to the semi-final. It faced Team Logan again and won 10-7. In order to qualify for the 2019 Deaflympics, Team Jamieson had to make sure to win the Gold medal game against Manitoba. Mission accomplished with a score of 7-4. “The men’s and women’s curling tournament at the Canada Deaf Games was very exciting for the teams as well as fans, who came to cheer on athletes! Congratulations to Team Jamieson and Team Chan for their qualification to te 2019 Winter Deaflympics,” said Alain Turpin, Executive Director, Canadian Deaf Sports Association. In men’s curling, Team Chan began the round robin with a victory against interprovincial Team Raby (10-8), but lost its second game against the well-known Team Comte from Manitoba (3-8). Team Chan made it to the semi-final by ending the round robin with three wins and two losses. BC won the semi-final 7-6 against Team Raby. 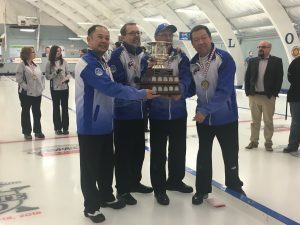 In order to represent Canada at the 2019 Winter Deaflympics, Team Chan had to win Gold against Manitoba. Mission accomplished with a score of 8-6. The host country and dates of the 2019 Winter Deaflympics will be announced soon.